Huntly Gordon Higgins was born in Perth, Western Australia on 8 January 1917. He was the son of Hal and Cora Higgins (nee Moore). Hal died at the beginning of the Great Depression when Huntly was 12 and the next few years were a struggle for the family. Huntly won a scholarship to Perth Modern School where he passed each year with distinction. He was a school prefect and president of the Literary Society. He shone at athletics and broke the school quarter mile (400m) record. After a brief period as a junior geologist in New Guinea, Huntly returned to the University of Western Australia taking honours in 1940. On graduation he joined the Great Boulder Mine in Kalgoorlie as a geologist and also lectured in geology at the Western Australian School of Mines. He was offered, by the RAAF, a commission to study and practise meteorology where his first original work, with a colleague, concerned a theory on frontal development that had practical implications in weather forecasting. The first test of the theory led them to forecast a thunderstorm accurately. The commanding officer, however, admonished them for failing to predict the size of the hailstones! His report on katabatic winds was widely adopted in the prediction of tropical cyclones. Early in 1945 Huntly was Assistant Divisional Meteorologist for NSW. Huntly was an outstanding paper physicist and research leader, who became world-renowned for his contributions during the major period of development of the Australian industry. He authored and co-authored over 180 scientific reports and publications. On joining CSIR he identified factors affecting the strength and stability of Australian tree species, and the adhesives used in plywood manufacture. With colleagues, he built an instrument to measure stresses and strains; this became a forerunner to a commercial materials-testing apparatus. His strength in tackling complex problems was demonstrated again in 1953 when he was appointed head of a new Paper Physics Section. His work uncovered the importance of the thermo-mechanical properties of lignin (a major component of all wood). Together with industry, Huntly’s team demonstrated that many eucalypt fibres could become desirable feedstock. His team made major contributions relating fibre history and properties to paper properties, and to the mechanisms of fibre bonding. His knowledge of fibre separation assisted CSIRO’s work on the replacement of asbestos by cellulose fibres. 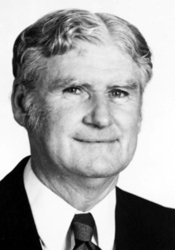 With the formation in CSIRO of the Division of Chemical Technology in 1972, Huntly was initially co-ordinator of the Renewable Resources Program. He was appointed Assistant Chief in 1974, and Chief in 1979. His friendly, supportive style of management was appreciated by all staff and colleagues that he mentored. His expertise in forest resources led to his involvement in aid programs in a number of developing countries, including Papua New Guinea, Malaysia, India and Guyana. Following retirement in 1982, Huntly was a CSIRO Honorary Fellow for over 20 years. A noteworthy publication from this period was his monograph â€œPaper Physics in Australiaâ€. The total span of his service amounted to nearly 58 years (1945 ‘ 2003). Huntly referred to this period as â€œthe longest, most coherent, and most significant phase of my lifeâ€. Huntly was active in nuclear disarmament circles and the peace movement. He was Chairman of the first South East Asian Regional Pugwash Conference, held in 1967 and the Australian contact for many years. Pugwash is a world-wide body of scientists dedicated to the application of science for peaceful purposes and the benefit of mankind. Huntly’s concern for the world and humanity in general was matched by the help he gave to family and friends. Huntly had an enquiring mind, an astounding memory and remarkable general knowledge. In his final years he spent much of his time playing bridge and researching family history. He was a proud descendant of early settlers Georgiana and Andrew McCrae (of McCrae Homestead) who arrived in Australia in 1841. Georgiana McCrae, a diarist and artist, was the daughter of the 5th Duke of Gordon and Andrew was an Edinburgh solicitor. The McCrae Homestead is Victoria’s oldest, original existing house and is a National Trust property. Designed by Georgina, it was built in 1844, using locally felled timber in drop-slab construction on one of the largest leases in the Port Phillip colony ‘ Arthur’s Seat Run ‘ 33 square miles ‘ 20500 acres (8296 ha). The McCraes were one of the first six pioneer families on Mornington Peninsula. Huntly’s ground breaking achievements were acknowledged in many ways. He was awarded a Doctorate in Applied Science by the University of Melbourne in 1962. He was elected to many scientific and technical associations and fellowships, both Australian and international. In 1967-68 he was president of the Technical Association of the Australasian Pulp and Paper Industry (APPITA) and their LR Benjamin medallist in 1977. 1977 LR Benjamin medallist of the Australasian Pulp And Paper Industry Technical Association (APPITA). Hewertson W, 2012, Huntly Gordon Higgins Obituary – An outstanding scientist and contributor to world peace. Published in the Age newspaper 25 Feb 2012.